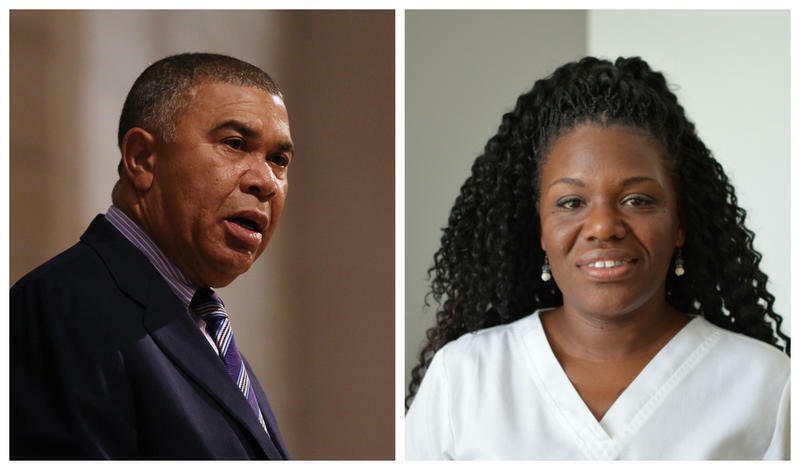 Can Cori Bush end Lacy Clay’s flawless streak at the ballot box? Lacy Clay, left, and Cori Bush, right, face each other in an Aug. 7 Democratic primary for Missouri's 1st Congressional District. Congressman Lacy Clay may be the Missouri equivalent of professional-wrestling great Mr. Perfect. That’s because the St. Louis Democrat has never lost an election for the Missouri Legislature or Congress. In fact, his father, former Congressman Bill Clay, won every aldermanic and congressional race during his long tenure in public service. Many attribute this electoral success to a stout political organization — and decades of loyalty. Florissant resident Cori Bush is the latest Democrat to try to end Clay’s undefeated streak in Missouri’s 1st Congressional District. The Florissant resident is getting support from St. Louis’ cadre of left-of-center Democrats, as well as an up-and-coming New Yorker who upended a powerful congressman earlier this year. The Clay-Bush race is the latest salvo in the long-running battle in St. Louis between established Democrats and those dissatisfied with the status quo. While Clay is stressing his experience and service to the community, Bush contends it’s time for a change. St. Louis Public Radio's Jason Rosenbaum and Jo Mannies examine two competitive Democratic primaries for congressional seats. This isn’t the first time a St. Louis Democrat questioned Clay’s political pull. For his part, Clay isn’t worried that Bush will be the first to defeat him. “I’m comfortable that we will get our message out to the public,” Clay said. 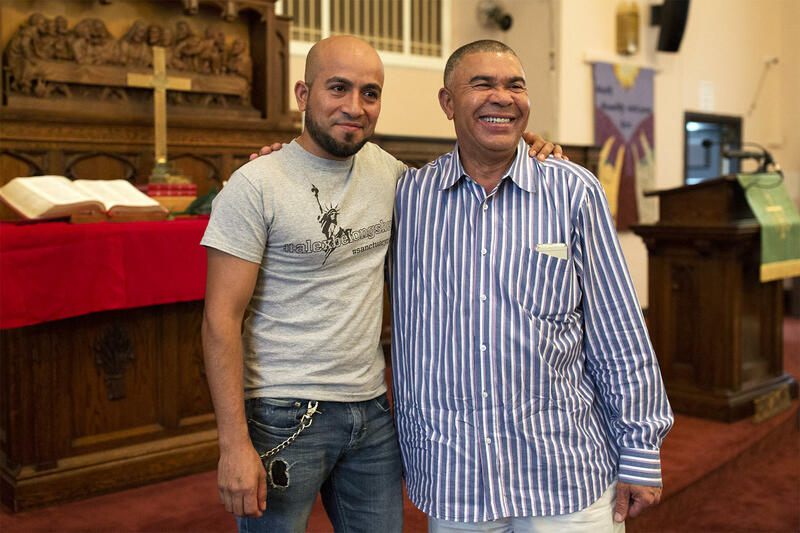 Alex Garcia and U.S. Rep. Lacy Clay pose for a picture after meeting in May 2018. Clay is the dean of the Missouri congressional delegation, having first been elected to the U.S. House in 2000. If he were to win against Bush and two other Democrats on the Aug. 7 ballot, Clay will reach 20 years of service in Congress. That’s in addition to an extensive tenure in the Missouri House and Senate. Clay believes that type of experience matters to the 1st District. Members with more tenure tend to be able to do more in the U.S. House, since power and seniority go hand-and-hand. If Democrats are able to obtain a majority in November, Clay said he’ll be able to effectively advocate for economically distressed parts of the district through his seat on the House Financial Services Committee. His focus, he said, will be bringing economic opportunities to the federally designated Promise Zone — which covers most of north St. Louis and north St. Louis County. Clay is also a member of the House Committee on Oversight and Government Reform, which has conducted high-profile hearings regarding Russian interference in the 2016 election cycle. Cori Bush addresses police officers outside Busch Stadium in September 2017. While Bush hasn’t been elected to anything before, she’s not a stranger to politics or activism. Bush’s father, Errol Bush, has served either as mayor or an alderman in Northwoods for years. She gained notoriety and built relationships for her activism after a Ferguson police officer fatally shot Michael Brown four years ago. When Bush ran unsuccessfully for the U.S. Senate in 2016, she also stumped for U.S. Sen. Bernie Sanders’ presidential campaign — even making a speech for him in Edwardsville. All of this experience, she said, sets her up well to run against Clay. More than any particular policy issue, Bush said if elected she wants to use her post to empower people throughout the district. She said that her life experiences — which include being homeless and dealing with financial problems — give her empathy for the working poor. Thus far, Clay amassed more campaign money than Bush — and has more money to spend in the run up to the primary election. But Bush’s campaign received some national attention after a visit from Alexandria Ocasio-Cortez, who upended incumbent New York Congressman Joseph Crowley earlier this year. Alexandria Ocasio-Cortez and Cori Bush prepare to take a photo on July 21, at SqWires Restaurant in St. Louis. “It would show that the Midwest can stand up and have this positive change,” Bush said. Clay said he’s unconcerned about Ocasio-Cortez’s decision to get involved in his contest. He also disputes the idea that he’s not “progressive,” pointing to a voting record that ranks him high on some national lists of liberal members of Congress. Moreover, Clay said that St. Louis’ renegade faction of Democrats haven’t done a particularly good job of gaining favor in north St. Louis or north St. Louis County. For instance, St. Louis Treasurer Tishaura Jones, who had support from St. Louis’ “progressive” activists, failed to carry north St. Louis wards. A number of St. Louis ward organizations and labor unions are backing Clay’s candidacy. Organized labor members are expected to come out on Aug. 7 for the referendum over right to work. But other elected officials, including state Rep. Bruce Franks Jr., D-St. Louis, and Alderman Annie Rice, D-8th Ward, are supporting Bush. Two leading candidates for the 2nd Congressional District, Cort VanOstran and Mark Osmack, have attended Bush’s events with Ocasio-Cortez, though they told St. Louis Public Radio that doesn’t constitute an endorsement. Bush said the energy from her supporters will present her campaign with a different fate from Democrats who lost badly to Clay, such as state Sen. Maria Chappelle-Nadal and former Congressman Russ Carnahan, D-St. Louis. Because the 1st District is heavily Democratic, the winner of the Aug. 7 contest will be favored in November.